FRONTMAN FOR THE TOMBSTONES ,IS A GEORGIA BORN SINGER/SONGWRITER WHO NOW RESIDES IN AUSTIN, TEXAS.CURRENTLY SPORTING 3 SOLO RELEASES BESIDES THE TOMBSTONES, HIS LATEST SOLO CD RELEASE "7:30 am" SHOWCASES HIS FINE SINGING AND CONTINUING GROWTH AS A SONGWRITER. THE CD SPENT 6 WEEKS IN THE TOP TEN OF THE XMRADIO CHANNEL12 (X-COUNTRY) CHARTS, INCLUDING TWO WEEKS AT # 1. STEVIE IS ACCOMPLISHED PERFORMER BOTH SOLO AND WITH HIS BAND.IN 1986 HE PENNED THE TOMBSTONES CLASSIC NOBODY .THIS SONG WAS LATER RECORDED BY PUNK PIONEER STIV BATOR. IN HIS EARLY DAYS AS A TOMBSTONE HE PURCHASED THE HEADSTONE MARKING THE RESTING PLACE OF BLUES LEGEND ROBERT JOHNSON.PASSING THE HONOR TO JOHNSONS PEER JOHNNY SHINES THE MATTER WAS SWEPT UNDER THE RUG FOLLOWING CONTROVERSY IN THE BLUES COMMUNITY PRESS. 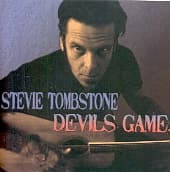 Devils Game" is a new collection incorporating Georgia native Stevie Tombstones out of print "Second Hand Sin" and "Acoustica" CDs alongside selected odds and sods. Tombstone first came to prominence as a solo artist via the 2003 release "7:30 A.M." which received substantial airplay in the US, Europe and Australia. (and incidentally spent 3 weeks at #1 on XM Satellite Radio's "X-Country" Channel,and two months in the top ten) The spare, acoustic tracks of "Sin" (produced by Jeff Johnson of Jason & the Scorchers) highlight Stevies songwriting approach of melding country-blues and gospel with dark and world-weary lyrical themes. The tracks from "Acoustica" capture this same stripped down presentation in a rowdy live setting while the bonus tracks feature guest appearances from members of the Georgia Satellites and Soul Asylum. The set is rounded out by a stellar cover of "Folsom Prison Blues" and Tombstones new holiday classic "Christmas On Red River".